Scientists have made a discovery that could lead to a treatment for Fragile X syndrome, the leading known cause of autism. Fragile X is a genetic disorder that causes inherited learning disabilities. It may affect around one in 4,000 males and one in 8,000 females. There is a significant overlap with autism, with around half of those with Fragile X also estimated to have ASD. Now, however, a team of researchers has provided a promising lead in battling Fragile X. They have identified a single protein that appears to be the culprit in causing many behavioural symptoms of the disease. They have also identified molecular and cellular abnormalities related to it. Their research has, in addition, identified an experimental compound that could eventually lead to a drug to treat Fragile X.
Michigan State University led the research. 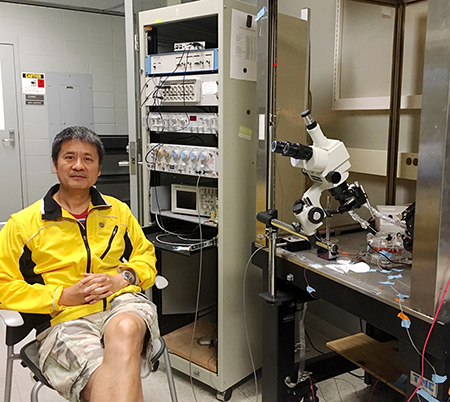 The study co-author is physiologist Hongbing Wang. He said: “We began with 600-800 potential protein targets, searching for the equivalent of a needle in a haystack. Subsequent tests of the team’s prime-target protein on the Fragile X mouse model revealed several key results. First, by reducing the expression of ADCY1, the team eliminated many autism-like behaviours. Second, the protein’s increased expression caused increased signalling in neurons. By reducing levels of ADCY1, the team dampened neuron signalling to levels within a normal range. Wang said that finding a single target that was responsible for so many of the causes of Fragile X made the research attractive to pharmaceutical companies. “Our research has identified a key target and a new approach that could easily be pursued by pharmaceutical companies,” he said. NB001 is an experimental compound that also holds potential as a painkiller. It delivered positive preliminary toxicity tests. It also demonstrated the ability to pass the blood brain barrier, the protective membrane separating the bloodstream from brain extracellular fluid. The study revealed a critical target and potential medicine. Nevertheless, Wang added that the findings are still years away from possible human clinical trials. Could doctors stop the disease? In addition to potential drug development for adults, future studies could focus on children. Since the team studied adult mice, the question of catching the problem at an earlier age has yet to be addressed. If caught at an early age by a blood test, could doctors stop the disease before symptoms surfaced? The National Institutes of Health and FRAXA Research Foundation funded the research. The study appears in the current issue of Nature Communications.